I am from Rio de Janeiro, Brazil, but now I am living in Portugal. I run a blog about popular science dedicated to Portuguese speakers (Brazilians mostly) called Blog da Ciência. I work mainly as a freelancer copywriter for a content marketing company. My work is to write blog posts about digital marketing for various different clients. I’m working on some SEO projects. My dream job would involve having more projects like those. 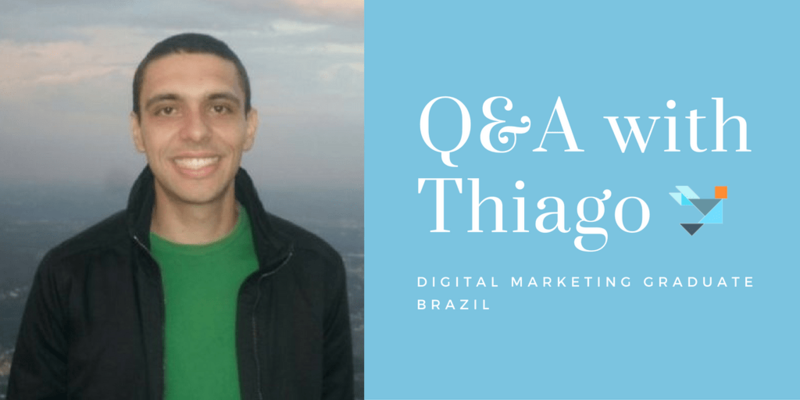 I have a degree in Computer Engineering and I worked for many years in the technology market, including being a co-founder of an IT company in Rio de Janeiro. After some years I realized that I was not satisfied and decided to quit. When I quit, I started to study SEO and Inbound Marketing. I made a couple of compact online courses until I had the idea to check Coursera’s courses on Digital Marketing. And there it was, a brand new Digital Marketing Specialization. I decided to start this specialization because I saw it as an opportunity to make the shift in my career in less time than a classical education. At the same time, it was a great chance to build digital marketing knowledge on top of traditional marketing concepts, all taught by experts from an exceptional university. I finished the courses, so I think that learning how the digital marketing in changing the marketing mix (for better) was the most exciting. Especially how customers are participating more and more on product development and improvement. I love technology and the Internet. After understanding many of the Digital Marketing concepts, my vision about things I was used to dealing with every day (social media, e-mail, blogs, search engines etc) changed quite a lot. But in my daily life, where I apply Digital Marketing concepts the most (despite my work, of course :D) is on my blog. The concepts related to SEO, content marketing, and social media management are always very helpful. 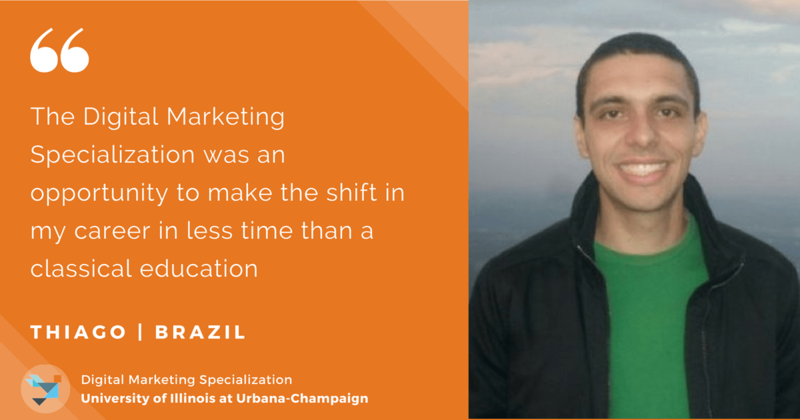 When I did the Digital Marketing Specialization, I was helping on my family’s business during the day and studying during the night. I organized myself to finish a module every week, so before starting the study week, I checked how many videos and tasks the module had and programmed how much I had to study each day. Usually on weekends I was dedicated to the peer assessments. Keep in mind that knowledge is always a great investment. The specialization gives you a great opportunity to get in touch with a wide variety of subjects. Some of them you probably might not have heard about. You will also be able to connect with students all over the world and discuss with them on the forums. Compare your point of view with other students’ while you grade their work. Learn to accept critiques when you get other students’ feedback on your work. I think those are enough reasons to recommend this specialization. Sign up to become our next learner of the week!